The weed of crime bears bitter fruit...and if criminals cultivate the crops, it is The Shadow will do the reaping! Hear The Shadow fight crime, as he becomes both the stalker and the stalked, in an assortment of tales featuring some of his most exciting encounters with some of the series most sinister scoundrels. Whether matching wits against a spy, a madman, a monster or a psychotic killer, he forces his foes to face the stark realization that crime does not pay! This collection includes the previously lost episode The Mine Hunters, starring Orson Welles, which is available here for the first time since its original broadcast - plus three newly sourced recordings of episodes from the 1938 BF Goodrich sponsored season, and a Program Guide by radio historian Martin Grams, Jr. 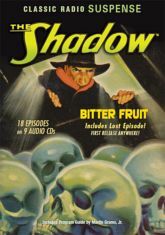 The 18 digitally restored and remastered episodes featured here star Orson Welles, Bill Johnstone, and Brett Morrison as The Shadow, with Agnes Moorehead, Margot Stevenson, Marjorie Anderson, Lesley Woods and Grace Matthews as Margot Lane.